Last year Tony built a Mini Vee and then raced it in GT Pro during the 2010 racing season. Driving in five of seven races, he finished in sixth place overall in a total field of twelve drivers. Apparently Tony enjoyed the building/racing experience, because he's gearing up to do it all over again, this time with a Pro Tunnel. ... And at least one to make it faster. Well, next summer I'll be sure to glance over my shoulder now and then to see how that's working out for him (and hope he's lagging behind, and not about to lap me). 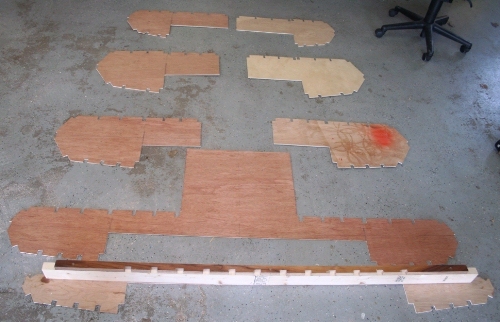 As always, the project begins by taking some perfectly innocent sheets of plywood and cutting them up into a bunch of funny shapes. 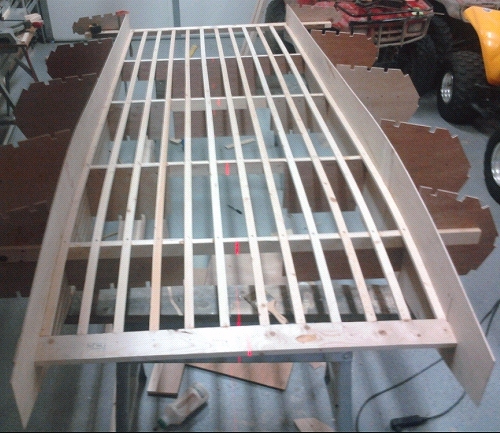 Put the bulkheads, transom, and stem together with the tunnel sides and you have the beginnings of a boat. Turned over, and the stations aligned by laser, the building begins in earnest. 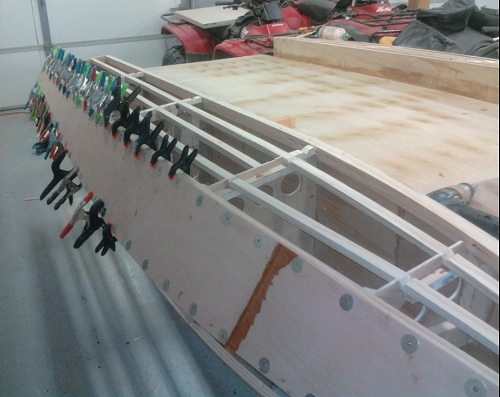 There are about three dozen stringers in this boat, so Tony's just getting started. 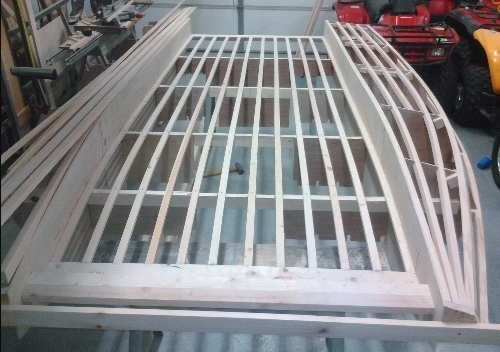 One sponson framed up, ready to tackle the other one. This brings up an issue I hadn't adequately addressed in the building notes (since corrected). To avoid introducing uneven stresses to your boat, it is a good idea to work on both sides of the boat at essentially the same time. 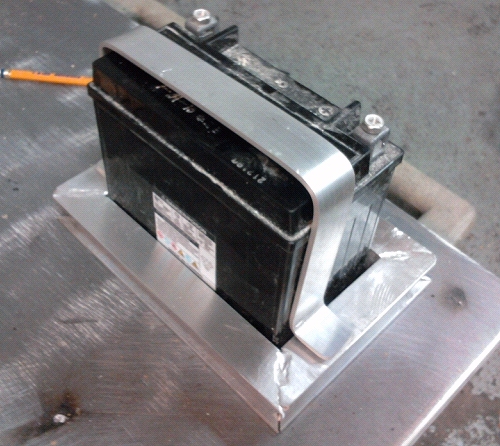 For instance, install the sheer clamp on one side, then install the sheer clamp on the other side. 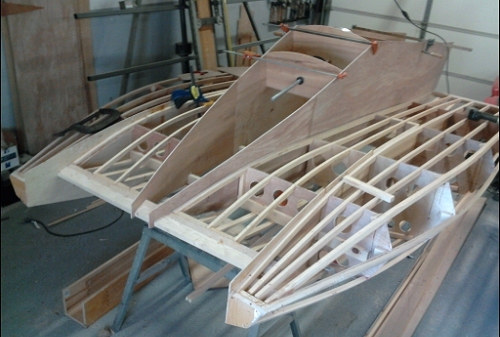 Then install the sponson keels on each side in succession. Then the chines, etc. A colder than average Minnesota winter makes it a bit too expensive to heat the garage, so Tony stays on the project by making some hardware. 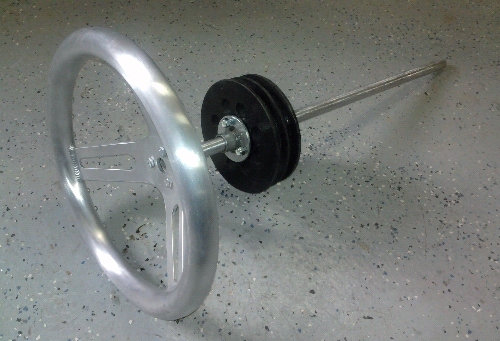 Here is his steering setup featuring a wheel found on ebay and a drum made from discs of marine plywood. "Total weight of both is 4.92 lbs.," he says. Tony continues to work on rigging while our cold winter continues. 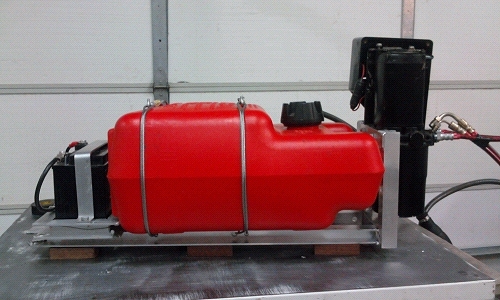 This unit provides a foundation for the battery, fuel tank and trim pump. 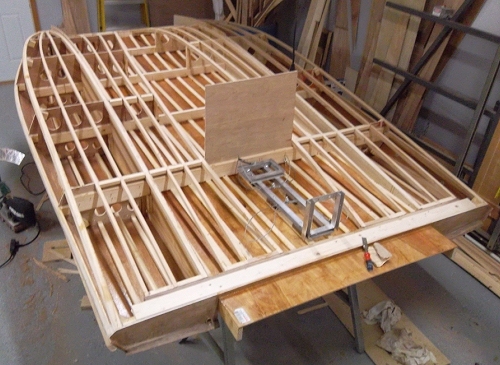 "My idea is to mount little glue blocks to the rails with brass thread inserts and then... epoxy the blocks to the tunnel battens (the aluminum rail is the same width as the center two tunnel battens)." Both sponsons are now framed, just about ready for the bottom plywood. 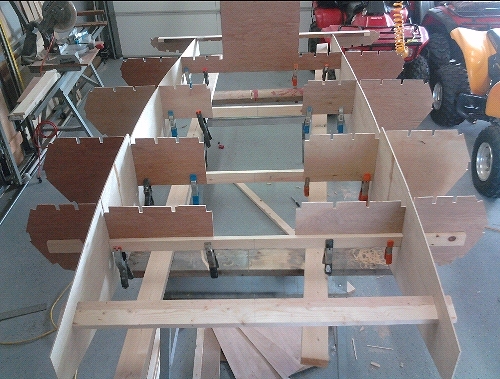 However, Tony decided he'd rather turn the hull over and continue with the framing. "All the beveling is done on all stringers (that takes patience)," he says. "So far so good on the project." 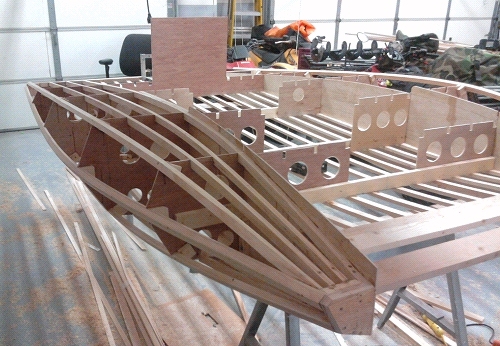 "Another late night of boat building. Just can't seem to stop once I start." "Once I get okoume I should be ready to rock this thing out. 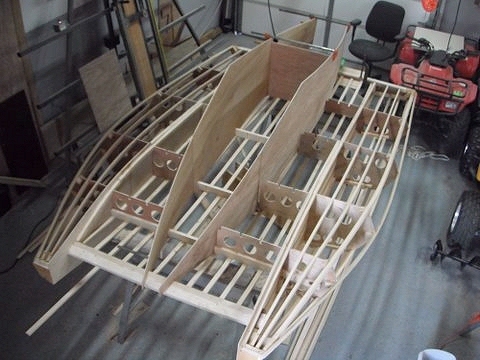 It is amazing how different the 2nd boat is to build. Much easier and quicker." 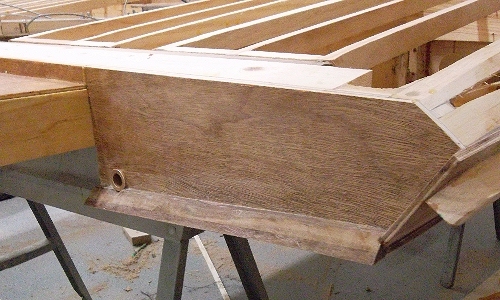 Tony decided it would be easier to cut (but not yet install) the coamings before any plywood planking went on. 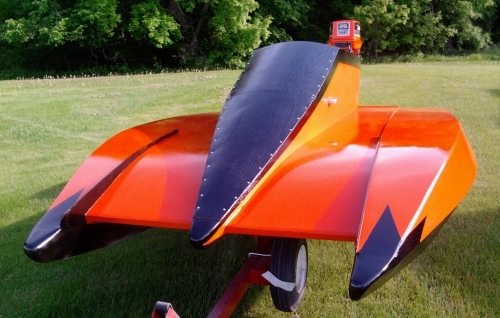 "I moved the dash area back about 6 inches, which in turn put the coaming height about an inch taller.... Keeping the same angle, it gives the front a longer look." This picture was apparently taken by a swallow nesting in the rafters. 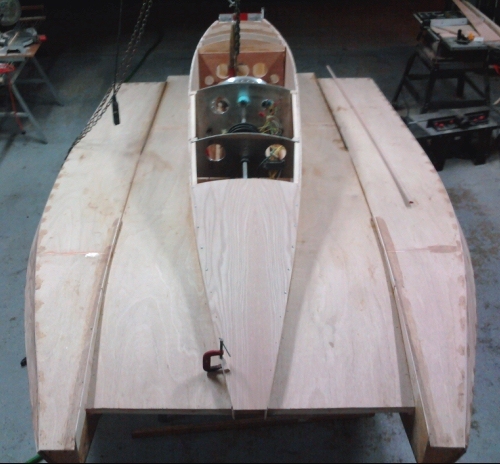 "It worked out nice making the coaming template without the tunnel planking on. Some skin is all it needs and it will be flying." This framework looks so good, seems a shame to cover it up with plywood. 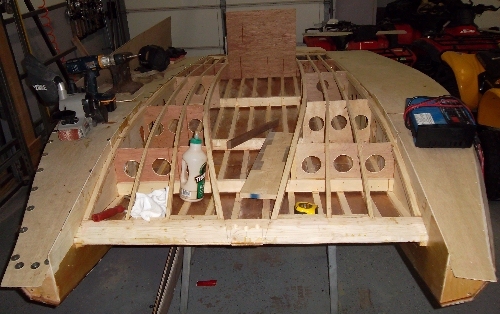 The last of the deck battens installed, plus the dash and cowling bulkhead temporarily in place. Now to the real business. Planking starts with the tunnel plank. "Hull is going on and hopefully done by this weekend," Tony says. "A lot of epoxy waiting time. Getting a good system down." And then on to the lower sides. 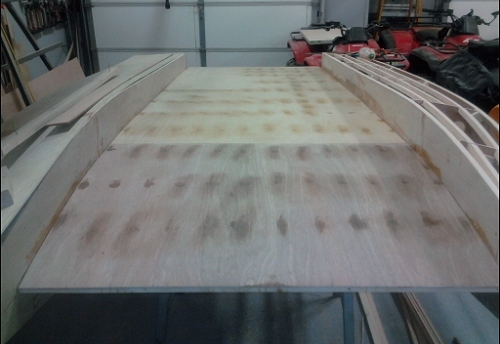 "I used 3/4 inch #6 particle board screws and 3/16 fender washers to hold everything tight. The #6 screw only leaves a tiny little hole to patch...."
With the bottom plywood on, Tony has turned her over again to work on the deck. "I added a piece of walnut on the back for protection and speed -- nice sharp edge." "I am getting there," he says. "Should be ready [for summer]." "Well everything is pretty much made and mocked up," Tony reports. "Just have to dissassemble all... and do the decking." "And finish the bottom, then reassemble all of the parts and off to the paint booth..... well it is not that easy." "Nose cone mold is done. That should be some fun. 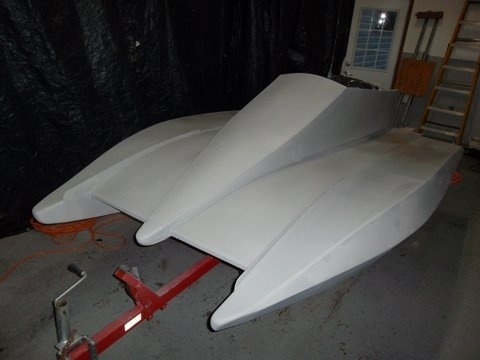 Never done fiberglass on foam before." 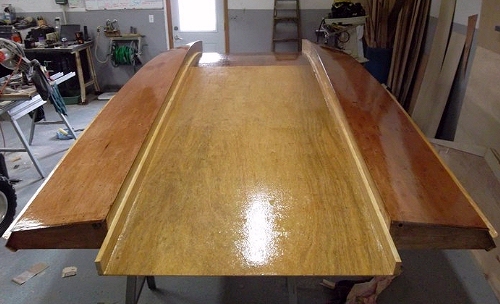 "2nd coat of Epoxy applied...," Tony says. He posted this photo on the Dillon Racing Facebook page, May 1. Right side up again, time to install the deck. 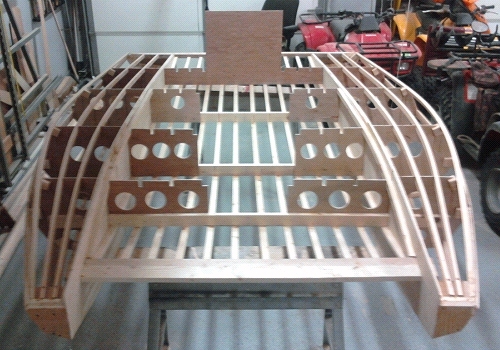 "I should have to boat almost done by Friday next week," Tony says, "except for paint. 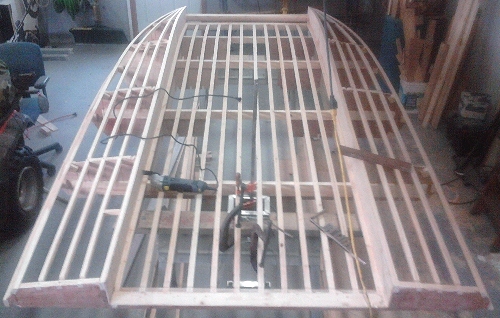 Finishing the decking this weekend so next week I can get the coamings and motor board and dash in." 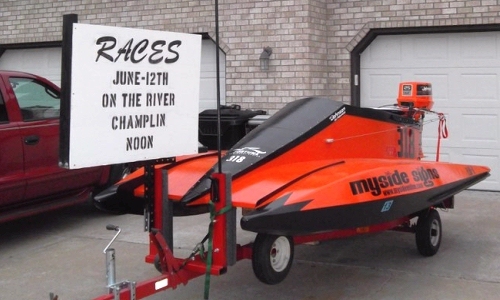 Racing is just a month away. "The next update it will be on the water," Tony promises. "Adding the rest of the goodies and me adds up to 663lbs total, according to my scale. With 1 gallon of fuel." Looking good, Tony. And just in time for the upcoming season. 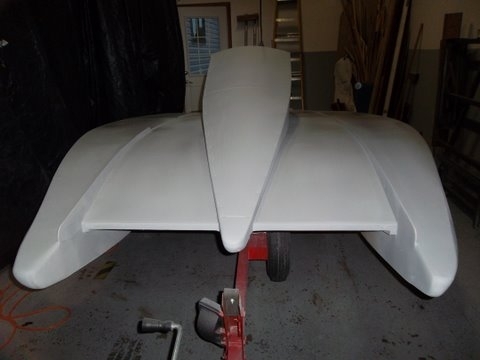 "Even in primer grey it looks like it want's to fly off the trailer," Tony says. WOW! Look at that!! Bravo, Tony. Beautiful job. I get the feeling this thing is sizing me up for lunch. 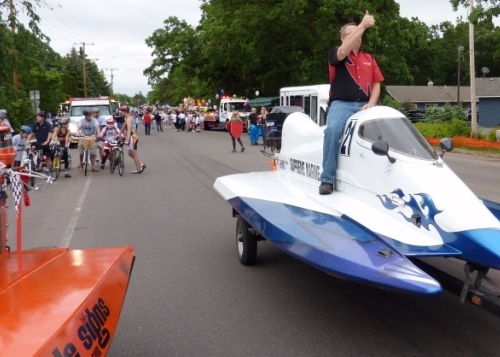 "First trip out," Tony reports on the first Saturday in June. "About 45mph at 6500. With a 20mph head wind and decent chop. A lot of boat traffic. It was hard to get a decent straight away. Should do better on the [race] course. Handles like a slot car...."
"I am going to run it just the way it is with the Ron Hill chopper," he says, one week before our first race. "No time to play around with it. Time is runnning out . I don't want to break anything." 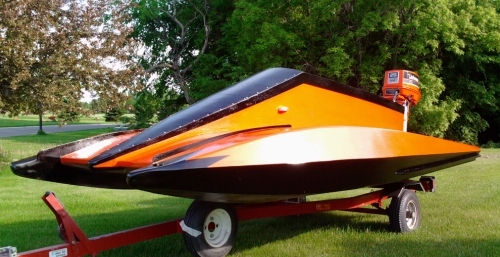 The video is "A final tribute to the boat build." 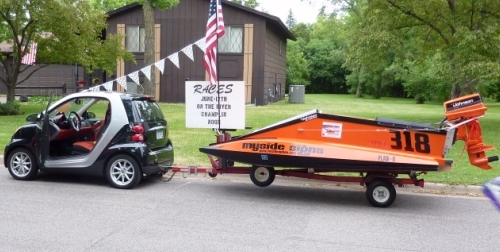 ... and as a parade float coupled with Bob Stone's Smart Car. Here Tony has a slight lead over Alan Tucker's SST 120. 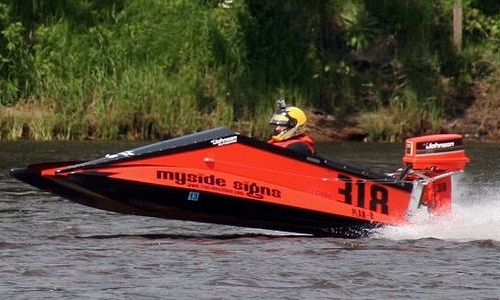 Finally on the water and racing. Tony posted this pic on the Dillon Racing Facebook page. "Fantastic design Bob," he writes. "Fast, handles well, and most important fun to drive." For Father's Day, Tony turned driving duties over to his dad, Ray. And put a Go Pro camera on his helmet.